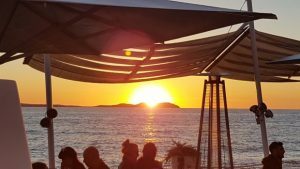 Don’t let the idea of travelling alone stop you from coming and enjoying the magic of Ibiza. Whether you’ve decided to come by your own or need some tips while you’re waiting for your friends to come, here is the know-how to exploring the island on your own. You made it to the airport, now grab a map and make sure you have your goggle map active. Our suggestion is to take a motorbike and discover the island without worrying about parking! 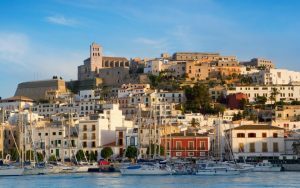 You will quickly realise that Ibiza is a beautiful place to observe and explore. There are a lot of amazing markets all around the island and a lot of different activities and attractions to suit every taste. The charm of the white traditional houses in the middle of the incredible nature is picturesque. The whole island is green, with notes of pines and citrus flowers scenting the air and the scenery offers amazing views of all the beaches across the entire coast with cliffs and turquoise waters. Es Vedra views- Head to Cala D’hort beach and turn right once you find ‘Es Boldado’ sign… seems an endless path but it actually takes you to the best sightseeing ever! 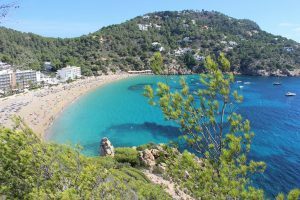 Cala De San Vicente- Up in the hills just before the beach there’s a stunning corner which will take your breath away. Heavens Door Sunset- Located in Santa Agnes de Corona a few steps from the restaurant, turn left until there’s no more land and just enjoy the beauty. Special tip? Bring your picnic basket with you. Mint Lounge: The perfect plan for every afternoon is to come here and watch the magical sunset while having a drink and enjoying the luxurious spot on San Antonio’s famous sunset strip. Besame Canalla: Stop by for a coffee, a juice or a cocktail, in front of San Antonio’s port. Opening this year, this new place offers a great atmosphere and service. ES MERCAT: The key aspect of this bar is the fresh products that comes directly from the local market. Open all year round, Es Mercat has a cosy interior space with a lovely terrace. 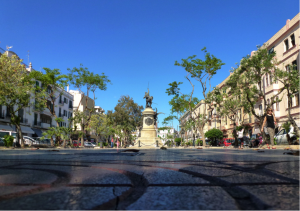 LE VRAI: Located in Vara de Rey, one of the most iconic streets on the island, stop for alfresco caña while observing the mix of tourists and locals daily live. Boat House: With swinging hammocks and big soft cushions, Boat House has a tropical vibe a variey of foliage and chilled music. Don’t miss Cala San Vicent’es moon shaped beach! Elements: One of the magical rocks of the island is here: Benirras! Come on a Sunday for a delicious lunch at Elements bar and stay until the drummers play their farewell ritual to the sun. Do you speak English?/ Hablas ingles? Where’s the bathroom?/ Dónde está el baño? Do you come here often? / ¿Vienes mucho por aquí? Have you got any plans for tomorrow / this afternoon / this evening? // Tienes planes mañana / esta tarde / esta noche? How do I get to….? 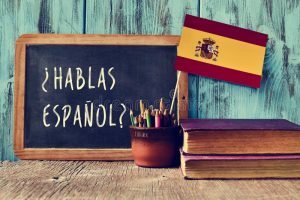 / Cómo puedo llegar a…? Can I charge my phone please? / Puedo cargar mi telefono por favor? How much does this cost? / Cuánto cuesta esto…?